If you'd told me this time last year that I'd be all about adding a bit of radiance, I'd have laughed in your face. As someone with oily skin, I used to be all about the matte finish, yet something in me has changed. The obsession really started over the summer, when I discovered the Makeup Revolution Radiant Lights Palette and Origins Vitazing; the products that banished my fear of the glow forever. Fast-forward six months and we are slap bang in the middle of winter (ew). Although my face manages to produce enough oil to fry a plate of chippy chips when it is sans makeup, give it a bit of slap and it is clear to see how dehydrated it is. 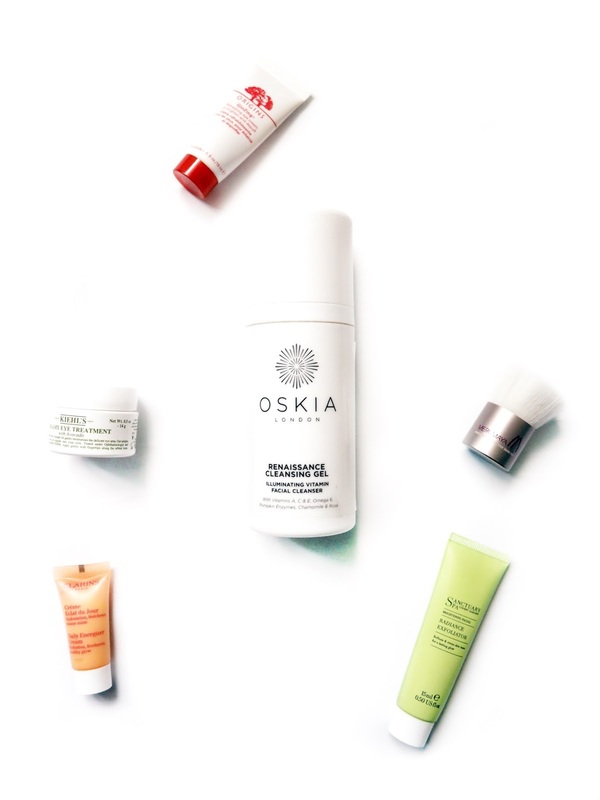 Aside from needing a change-up in the base department, dehydrated skin really calls for some changes to the skincare routine. This season I've added a few new products into rotation, as well as rediscovered some old favourites. 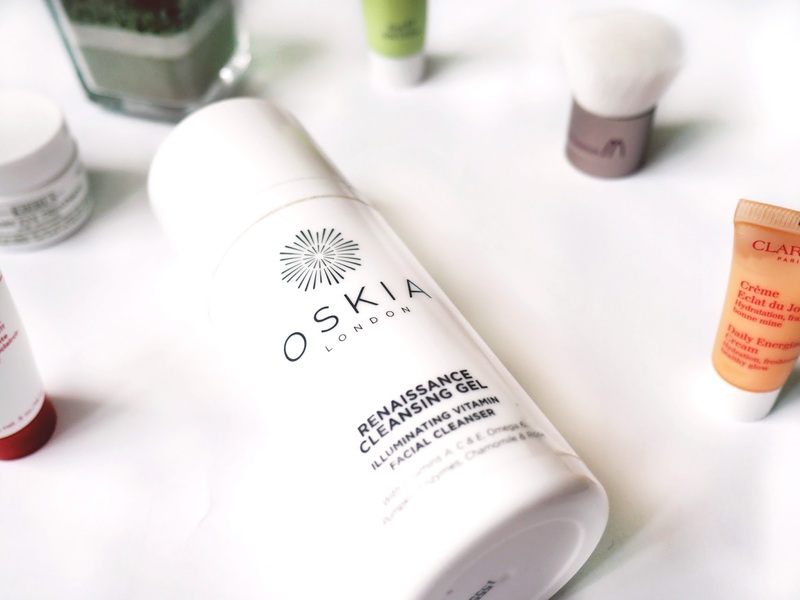 Starting off with a product that gets a hella lot of attention, and that is the Oskia Renaissance Cleansing Gel (£28). I adore this gel-oil-milk hybrid for quick cleansing in the morning, but where it really shines is adding a radiance that just isn't achievable with any other cleansers in my stash. Something to do with the oodles of vitamins and pumpkin enzymes, this has fast become one of my favourites, especially when I have been lacking in the sleep department. When my skin looks dull, the texture often starts to feel a bit ropey too. I've had a bit of a break from physical exfoliants over the last few months, but have recently rediscovered this mini Radiance Exfoliator (£10 full size) from The Sanctuary. It can be pretty scrubby, but paired with the Merumaya Manual Cleansing Brush* (read the review here), it is just perfect. Eye cream is something I just cannot be without, and one of my long-time favourites is the Ginzing Refreshing Eye Cream (£20) from Origins. This has brightening pigments that offer just enough colour correcting to make you look like you've had your eight hours, but often in the winter I don't find it hydrating enough. A recent love has been the Kiehls Creamy Eye Treatment with Avocado (£20), which is a lot richer than the Origins. I like to mix the two together to create a hydrating, yet brightening base for my peepers. Serums are usually a regular feature in my evening routines but the morning? Not so much. However the Caudalie Vinoperfect Complexion Correcting Radiance Serum (£45 full size) is just the bomb at giving a serious amount of glow to the skin and it is such an undiscovered skincare secret. Last but not least is moisturiser, and I've been trying out a few from Clarins. One that has really earnt its way into my morning routine is the Daily Energizer Cream. This adds the most beautiful lit-from-within radiance that makes you look the epitome of health when 99.9% of the time, you feel pants. Specifically tailored to women in their twenties, this moisturiser gives just the right amount of hydration to protect my oily yet dehydrated skin from the harsh winter weather. Skincare routine done, I am left with a glowy (but not greasy) base for my makeup. It makes my skin look a lot healthier and means my foundation doesn't cling to any dry patches. As I mentioned, my skin seems to have changed a lot this season, and I'm really happy I've found a great combination of products. How have you changed up your routine for winter?